The following obituary appeared in the The Bancroft Blade On September 2, 1921. I have attempted to recreate the text here in its entirety, although some of the original text is difficult to properly recognize. There is also a tribute to Michael on these same pages, written by his son, J. R. Kelly, that is not transcribed here. It can be viewed by downloading the original scans. Michael Kelly, Nebraska pioneer who departed this life at the home of his daughter, Mrs. Alvin Browning in this city Monday evening, August 22nd, 1921, at eight o’clock, was born near Tralee, County Kerry, Ireland, November 1, 1849, and was thus 71 years, 9 months and 21 days old. Orphaned at an early age by the death of both father and mother, he with his elder brother, Patrick Kelly, immigrated to America at the age of about ten years, landing in New York and going to the home of an uncle near London, Ontario, Canada, where they remained for some years. Learning of the great West in the United States, they decided to cast their fortunes there and, in 1867 Mr. Kelly in company with Joseph Henzy set out for Nebraska, planning to meet up with Captain Michael Evans, a pioneer settler near where Decatur, Nebraska, is located. Arriving in Omaha and finding their funds almost exhausted, they set out on foot for Decatur, then the metropolis of North Eastern Nebraska and vieing with Omaha as one of the first cities of the state. It was here he met up with and became acquainted with S.R. Fletcher, in charge of one of the relays of the stage line from Omaha to Decatur, the only transportation line of that part of the country of that time, an acquaintance that broadened into a friendship that was maintained through life. His brother, Patrick Kelly, later joined him and they were employed on various construction projects that were then having their beginning in the great west. Later both acquired homesteads southwest of Bancroft. During the pioneer development of these places, the returns from which were meagre and wholly insufficient to sustain them, he in company with other pioneers of the district, found work through a period of years in railroad construction and bridge building of the pioneer transportation companies of Western Iowa and Eastern Nebraska, including the first bridge across the river at Omaha, the North Western Railway west from the river, railroad construction in and about Fort Dodge, Iowa. Through the long winter months with construction work at a standstill, he in company with two other Nebraska pioneers, John Conlin of Bancroft and a brother, the late James Conlin, contracted the cutting of timber along the Missouri river near Decatur, much of which was used in the construction of the pioneer buildings of that time, with quantities shipped from that point on boats that then plied the Missouri with the regularity of our train service of the present. Among his employers and associates were the late Count John A. Creighton and John L. Blair, both pioneer builders of the west. For years prior to the construction of the present M. & O. railway, Fremont, Decatur, and West Point were his trading places and the pioneers residing between his neighbors. He was privileged to live [???] this community and to see the frail attempt of development of his own hands broaded and multiply into a picture of prosperous homes and farm lands and enjoyed no more pleasing time than when in the later years of life he stood or walked about the grounds of his home, which, on a high elevation, overlooked the Logan Valley and neighboring towns which once he knew as an endless prairie and over which he hunted the wild game for his sustenance, marveling at the progress made, and content that the dreams of the pioneer had come true. Friends will long remember and picture to themselves again and again this rugged kindly man whose life was interwoven into and a part of every step of progress of this community, and who walked through it so that to know him was to call him friend. He was wedded to Hannah Evans in the early days of his settlement here and for a number of years resided on their farm southwest of this city. To this union was born two daughters and two sons, Mary Browning of Bancroft, Ellen Flock of Regina, Canada, J. R. Kelly of Angora, and Edward Kelly, who died in infancy at the time of the death of the mother in 1881. After this time, Mr. Kelly removed to Bancroft and has been actively engaged in the business and community life of this district ever since. 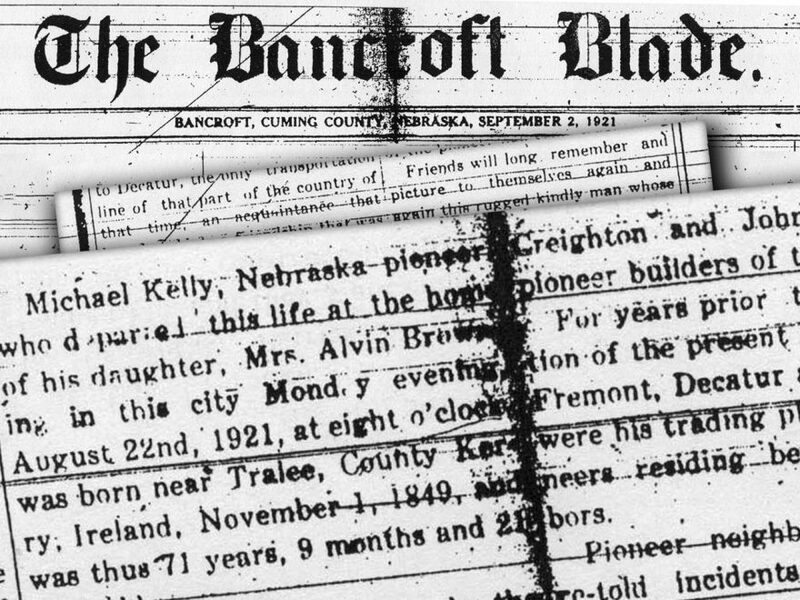 In later years he was united in marriage to Mary Cronin and to this union were born Mildred Monaghan of Dalton, Neb., Lucille Carey of Bancroft and B.M. Kelly of Strong City, Kansas, all of the children being with him during his last sickness and burial. The funeral service was held at the Holy Cross church in this city on Thursday, August 25th, at ten o’clock, Rev. Father O’Donoghue of Kansas City, Mo., and Rev. Father Quinn officiating. People of the entire town and countryside, as well as large numbers from other towns, filling the church yard, gathered to pay their love and respect to this geodly man. John G. Gannon, Rosalie, Neb. F. C. Nielsen, Omaha, Neb. J. E. L. Carer, Denver, Colo.
F. D. Hunker, West Point, Neb. Guy T. Graves, Pender, Neb. The active pall beares were J. O. Copple, J. H. Stream, R. E. Cates, A. G. Zuhlke, John Ronk and Terrence McKeegan. His body was laid to rest in that long, peaceful sleep in the cemetery overlooking the valley and the land he loved so well. We wish to express our sincere thanks and appreciation to the many friends for their kindness, help and affection, and the many beautiful flowers during the illness and burial of our beloved Father. The original source documents are provided below.